It seems like, with every month that passes, Samsung is getting better (and faster) at pushing out Android’s monthly security updates to its flagship devices. 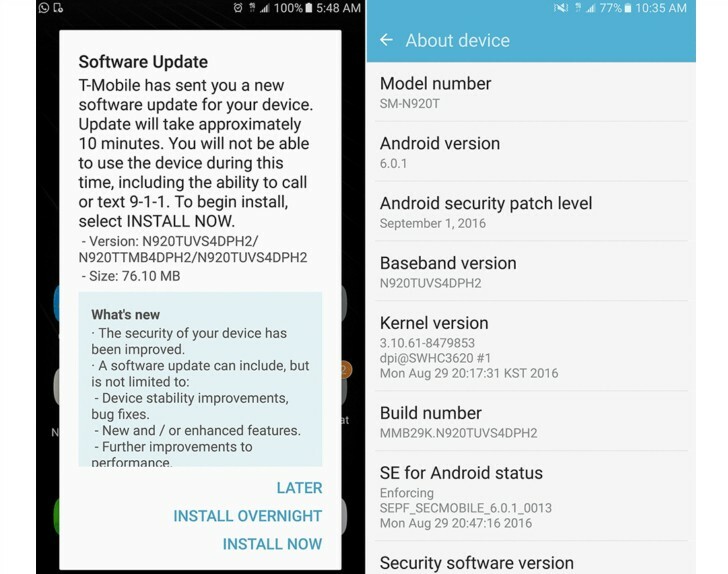 This month, the September patches have started rolling out to unlocked Galaxy S7 and S7 edge units in Europe even before Google made the security bulletin official. And now, just two days later, a carrier version of an old flagship Samsung smartphone is receiving the update too. We’re talking about T-Mobile’s Galaxy Note5, which is in the process of getting updated to build N920TUVS4DPH2, as showcased by the screenshots below. As you can see, the September security patch is a 76MB download, so it shouldn’t take very long to grab regardless of your connection’s quality. Samsung and T-Mobile have only said “the security of your device has been improved” in the changelog, but thankfully the Korean company has detailed what precisely goes into this September release just yesterday. Hopefully more Android device makers will take these security fixes seriously in the future, but if the way they handle general OS updates is any indication, then don’t bet on it.